Whimbrel is one of the most widespread of the curlews. With four subspecies, it breeds across much of the sub arctic including North America, Asia, and Europe as far south as Scotland. In Scotland the breeding strongholds are on Shetland, Orkney and the Outer Hebrides with smaller populations on the mainland at Sutherland and Caithness. In Scotland there have been some indications of local declines. In Orkney for example, post 2000 breeding numbers are around half that of the previous decade. In other parts of Scotland it is a widespread passage migrant mainly in the west in spring and east in autumn. Whimbrel winters on coasts in Africa, South America, south Asia into Australasia and southern North America. On Arran, it is during the migration from the sub arctic to the west coast of Africa in the spring that it is most likely to be seen. Most of the records on Arran occur between mid-April and the end of May. Flocks normally follow the coast but they also cross inland mainly along valleys and glens. Recent Arran records include thirty nine on Cleats Shore on 8 May 2010, twenty eight in Auchenhew Bay on 4 May 2011 and fifteen in Glenscorrodale on 20 May 2012. The total passage numbers may be considerably higher than numbers counted on the ground. Whimbrel is very vocal on passage and its distinctive seven whistles is often the only evidence of high flying birds. Incidentally this distinctive call is often associated with a Celtic superstition of the 'seven-whistlers', supposedly a group of six birds looking for a seventh - hearing the call augured death or other disaster. 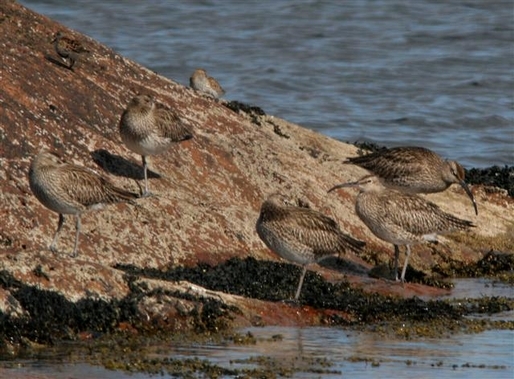 The only similar species with which it is likely to be confused on Arran is the Curlew ( photograph below on left). 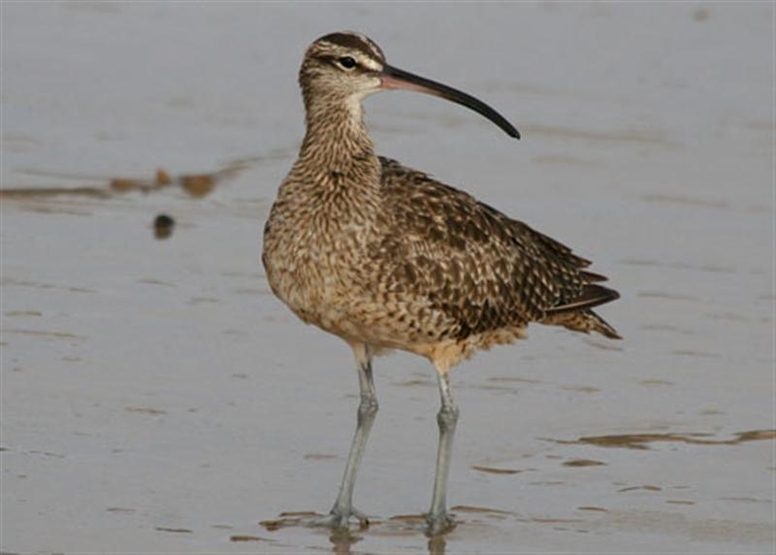 The Whimbrel is smaller with a shorter, decurved bill and a central crown stripe and strong stripe above the eye. 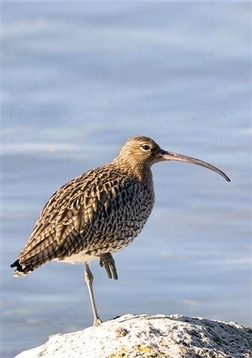 These distinctive head markings and its seven whistle call are much more reliable features for separating Whimbrel from Curlew than the length of the bill. The bill length in Curlew can be very variable, with females having longer bills than males and young birds having short bills.